Your place to discuss your deck ideas, find MTG resources, solicit feedback, and maybe even find some local players without going to Friday Night Magic (FNM). GWJ has a sealed league in MTG:O. You can find all the details about that in the Sealed MTG:O thread. Basic MTG Rules - Everything you need to get started. This is particularly pertinent if you're starting up again after not having played for years, the basic game structure has changed. tappedout.net - Great for prototyping new decks. You can draw sample hands, see your odds of drawing a card, view your mana cost breakdown and your average cost for the deck, and even set up a trade binder if you want to trade with other folks. Gatherer - Everyone probably knows this one, great for finding cards. Not so great if what you want is "things that gain you life", but great if you have a keyword you want (Exalted, Lifelink, Deathtouch, etc.) or if you want to get a quick list of something (i.e. all Red cards which cost less than 5 from Innistrad). Also has all rulings for cards, in case you need a question answered. MTG Salvation - Great site for articles, threads on deck building styles, spoilers for upcoming expansions, and up-to-date card errata. Magiccards.info - Great site for card pricing, it pulls prices from all the popular online retailers and gives you a nice table for comparing. Also has a very useful proxy printing feature if your house rules allow proxies, set legality list, and rulings on the cards. MagicWorkStation - Another deck building site, and has a client you can use to play with folks online. EDIT: Now with more thread hero image! MagicWorkStation is another great resource. You can build decks and fishbowl with it easily, and play against people online. There is no art, and it is a little fiddly, but I like it. Does anybody in the SF bay area play? I'd be game to set up a regular meeting, monthly or bi-monthly, to be able to play more often. I generally don't get to play more than 3-4 times a year right now. Boom Stick is my newest, it arose out of my buddy and I talking about how useless Serra Avatar is. However, I tend to trust Wizards when they classify something as Mythic Rare (though this may be a mistake), so I thought there must be something about Serra Avatar which makes it powerful. Then I thought of Brion Stoutarm, and my buddy suggested Fireshrieker + Loxodon Warhammer as a more consistent combo (plus Brion as an emergency kill response). Right now I'm stuck on thinking of other things to add that either support the theme, or just add other conditional responses. Xathrid Extractor came from wanting to use my Xathrid Demon (hence the name). I've play tested it a couple times and the idea is solid, but the deck is currently too slow, and is hurt by the CMC of 3.77. I need to get a few more early response options in there, and more cheaper things that can pump to feed the Xathrid later on. Reliquary a-go-go is trying to make use of my many Knights of the Reliquary. It's stalled right now, I don't know where to take it or how to make it work. I was originally going to make a land saccing engine from Crucible of Worlds, Zuran Orb, and Fastbond (a buddy of mine did this years ago for a Seismic Assault deck), but if I get that engine going I've already won the game, and there are better ways to make use of that engine than Knight of the Reliquary. Just don't see a good use for that knight, outside of draft for quick land exchange. Is there something like Mind Over Matter for green or white? Maybe the Seedborn Muse that you have in your other deck. The Knight searches for any land, so I'd get rid of the Sunpetal Groves and replace them with Evolving Wilds. With one tap of the Knight, you'd be getting 2 lands out and 2 into the grave yard. With those kind of drops, I'd maybe replace the Querion Elves with some Lotus Cobras to keep multicolour mana production. Man, I'd be hard pressed to NOT throw some landfall stuff in there. So yeah, Landfall was the next thought I had regarding this, but it runs into the same problem - the Knight becomes obsolete/unnecessary. If I were going to do a Landfall themed deck, it'd be easier to get the infinite land engine going and then go to town with Ob Nixilis or something like that. This is why I'm at the point of just writing the Knight off as a draft card, because it's fantastic for mana fixing in a closed environment, but just doesn't hold up in the Vintage realm. Definitely ignore the actual cards in that deck, like I said it got abandoned so those don't represent... anything really. Yeah, my buddy has a landfall deck with Ob Nixilis, and it is sick. Yep, that would do it. Toss in a Heartbeat of Spring, a Lotus Cobra, and you can cast anything you want while also annihilating 2-3 opponents. I'd like to see that mixed with some good old Storm cards, insanity ensues. EDIT: Speaking of Storm, one of my favorite decks has always been my Dragonstorm deck. I've tried modifying it a few times over the years, but nothing ever stuck, the core deck is just so simple and effective. I've gotten 1st turn kills with it, demolished 4 other players at turn 5, and more. Always good times. Valakut is pretty much the king for landfall type decks. Green Red Valakut ROCKED FACE in Standard for a while. Primeval Titan and all kinds of green stuff powers out a goofy number of mountains. You only need one valakut out to kill someone in a duel, but you could easily wait for 2-3 to be out to wipe everything. Vesuva makes this even better. Valakut rocks! I never was able to get my hands on Primevil Titans, so my Valakut deck is mono-red with lots of haste creatures that tap to do 1 damage, a few Emrakul's Hatchers to bring out Eldrazi tokens that are sacrificed for mana (fireball fuel) or equipped with Skullclamps to draw cards and pull more mountains. I'm sorry, veteran magic player here who stopped playing after Ravnica. Thanks to Aries, I just learned that Skullclamp was reprinted? I'm honestly surprised at this turn of events given the absolutely ludicrous power that this tiny artifact has. It was...in the Commander/EDH set. This doesn't change it's legality at all for Standard or Vintage or any of those. However, like Sol Ring, increased supply means increased availibility and decreased price. Oh I see. I jumped the gun. I can't access gatherer from work so at the casual mention of Skullclamp I took to googling as much as my work's firewall would allow but didn't realize that it wasn't put into Standard rotation. I acquired my Skullclamps through the selective purchase of Mirrodin premade decks, and I don't play tournaments so legality matters not to me! Skullclamp is also currently just under $2 at most places, so getting them is far from prohibitive. What I need to do next is make better use of my commons/uncommons, and my unused cards in general. I have an entire booster box (the actual box) full of unused rares, and 2 3x3 card boxes of commons/uncommons that are unused. 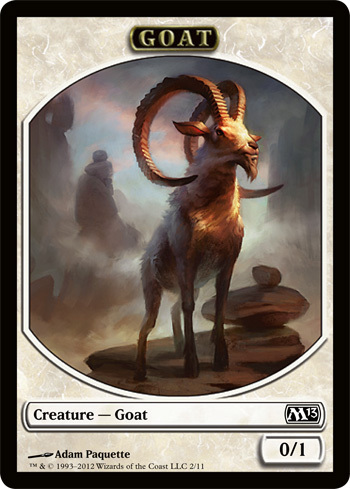 Valakut is among those unused rares, as is Avacyn, Gisela, every Planeswalker (except Jace, never got any of him), and myriad other amazing things. I'm pretty sure 2-3 Skullclamps are in there too. While I do not have near the collection as you seem to have, I have been thinking along the same lines. I want to try making a couple of Pauper decks that will hold up in my group, and I have been feeling the urge to tear apart the ~30 decks I have and build 5 - 10 new ones out of them. But not before I add them all to that fabulous website you linked earlier (tappedout.net). It's really fun to try and make use of all the cards that we tend to have sitting around. At a minimum it lets you know which cards you want to keep and which you can get rid of, and at best you get some really fun decks. I already linked my Stoic deck, and my Progenitor deck also came out of that (wanting to use my Progenitus, but not actually have to pay for him). Since you all have mentioned how awesome it is, I'll probably make a simple Valakut deck next. I wanted to pick up some of the better Landfall cards anyway, so that's a good excuse, and maybe the Knight of the Reliquary can find a home in there too. My collection pales in comparison to those of my friends I play with every few months, they've been collecting since 4th Ed with only a few breaks, and they still have most of it. They each have 4-5 binders full of unused rares, and boxes upon boxes of commons/uncommons. EDIT: Man, I need to update my tappedout decks, most of them are inaccurate. Progenitor doesn't have the Bringers anymore, and "Ach! Hans, Run!" got moved from the Maybeboard to the Mainboard (I love that card). I'm game to try, but I don't have anything that is Standard or Block competitive. Last time I tried playing my decks against some Standard decks my co-workers had it did not end well. I don't really have any standard or block specific decks either, mine are built of cards spanning sometimes 18 years worth of sets, and designed around multiplayer. Games over skype? Haven't thought of that before. This is bad. I haven't actively bought physical cards in a long while. I'm not sure I want to start that heroin drip. We could maybe try some multiplayer? I do have a couple non-standard decks (the planeschase ones that just came out), as well as the planeschase cards themselves (might be fun). I'm not sure how well skype does video confrencing with more then 1 on 1 though I've never tried it. Could be a fun experiment either way. It'll have goats? Well, I'm in. Reminds me of one of my favorite flavour texts on a card: "A typical day for a giant. A momentous event for a goat." It goes so well with the card art. Regarding playing online, how about we try a few sessions using MagicWorkStation (linked in OP) to see if people actually show? Then if that works out, we can decide if we want to swap to some video chat system and point cameras at our actual cards. I think we should definitely establish house rules before going any further though. I'd like to avoid someone showing up with a Standard competitive deck and whomping everyone who brought a casual Vintage deck in 2 turns. Likewise I'd like to avoid folks bringing a Black Lotus/Channel/Fireball deck. We need some kind of level playing field. I have tried to use MWS but coulnd not really get it to work. I'm willing to give it another shot but it seemed difficult to find matches online and the cards looked really small.... I don't like small cards. The artwork is part of the reason I enjoy the game. Maybe I missed a setting somewhere. ahrezmandi, are you experienced with magicworkstation? have you gotten games to work online? No, I've never used it before. About 8 years ago I used something similar, which had full artwork and support for adding new releases via data files, but Wizards shut them down. I'm honestly surprised MWS can survive, Wizards usually goes after anybody who uses actual card artwork, even if it's small. I'm mostly thinking about the organizational problems. It's difficult enough to get folks to meet up in anything online, but add on top of that video camera setup so your cards can be seen plus any other technical hurdles and it can be a deal breaker. Like I said, I'm totally game to try if someone wants to organize it. On Friday I played a 4 person game with some co-workers of mine. I went with my Angels deck because I knew the other people were playing either Commander decks, or had just gotten back into the game, so I didn't want to completely dominate with fancy things like Dragonstorming 6 dragons into play on turn 3. One of them was playing the Mirror Mastery deck, and he tosses out a Magus of the Vinyard on turn 1, then plays Collective Voyage on turn 2. So I'm sitting on 6 basic lands and 2 free mana on turn 3, happy as a clam. I toss down a Pristine Angel, and apparently none of them had seen it before because their eyes popped out of their heads. Subsequent turns see a Privileged Position, Eternal Dragon + Sword of Fire & Ice, and a chump blocking Eternal Dragon which kept getting revived by my Emeria, The Sky Ruin. I never did get my lifegain going though, so I won the game with 10 life. They all swore that next game I would be first to die. Next time I'm playing my Dragon deck. I think we should try it over skype. I should be around this weekened. I'm in Santa Cruz so we are in the same time zone ahrezmendi. Since I only have cards from the last years worht of sets maybe we should try some games in the pauper format. You know, only use commons. I don't have a pauper deck yet and it would be fun to make one. Then we woulnd't have to worry about anything being too powerful. I haven't played since 1995, but after watching some Loading Ready Run guys draft, as well as some other twitch.tv streams, I've decided I have very little interest in constructed (except maybe pauper) but that I find limited formats fascinating. I thinking of hitting my local games store this weekend for the M13 pre-release, but I have only the barest idea of what to expect. Any thoughts or suggestions?